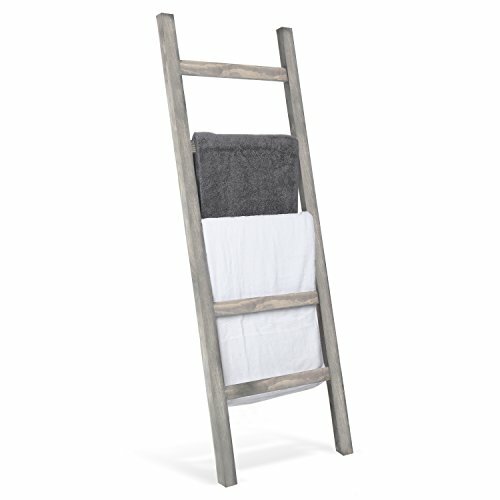 How often do you find yourself surfing the web looking for unique storage options like a blanket ladder? Cupboards and closets are, of course, the most convenient option, but something else is climbing through the ranks. The humble builder’s ladder is now making a name for itself – with a few adjustments here and there to make them suitable for household use. Ladders are now not only for climbing, but for storing your towels, quilts, blankets, scarves, and anything else you want to drape over them. They form a significant part of market displays, and also look lovely in bathrooms, kitchens, and anywhere in your home where you need to access blankets or towels at a moment’s notice. If you think such a storage option could suit your home, then it’s time to go shopping. Fortunately, you are not short of options. Take the time to view these nine top-rated options below, then move onto points to consider before adding them to your shopping cart. You will have a new quilt ladder set up in your home in no time. If you’ve been looking for a blanket ladder, but you only seem to find inferior quality options, then check out this model from Bellewood Designs. Unlike other options on the market which can be wobbly and unstable, this blanket ladder is stable, secure, and made to last. You can buy it in a length of three, four, or five feet, and either option also comes with three or four rungs on the ladder. All options have a 19-inch width and a four-inch depth. The sizing coupled with the rung options means you can use this ladder in all situations – for blankets, quilts, towels, or something else. That’s not all this blanket ladder has to offer either. It features solid wood, angled feet to sit nicely against your wall, and has felt padding on the back and feet to stop it marking your walls and flooring. It then has a beautiful aged and stained black finish that stands out from other options for sale. Sealing the deal is the personal touch from the seller who includes a handwritten note with every sale. Even though you pay more for this ladder than others, it’s worth every penny. When the time comes to give your home that stylish farmhouse look, then check out this blanket ladder from Bellewood Designs. Designed to cater to all your needs – be it for hanging blankets, quilts, or towels, it’s well worth a closer look. The farmhouse style is the first point of interest for a potential purchaser. It features a lovely rustic brown stain finish, three or four rungs, and angled feet for it to sit snugly against your wall. However, if you’re worried about damage, don’t be. There is a felt fabric on the feet and back to stop it from making any marks. However, if you have slippery flooring, you may like to add a piece of rubber on the bottom to prevent it from slipping. 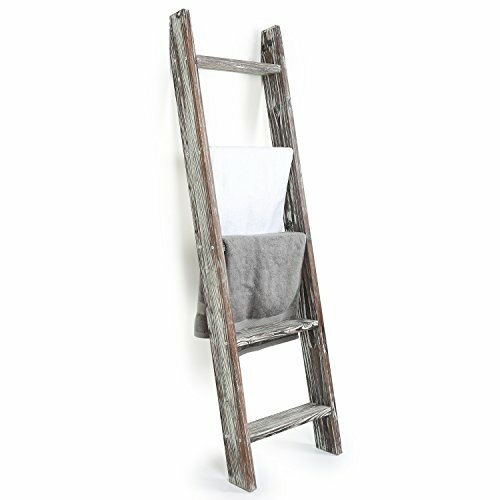 This blanket ladder also features 2×4-inch solid wood, and you can choose from a three, four, or five-foot option. Depending on which one you buy, you can then get three or four rungs for your quilts – with all ladders measuring at 19 inches wide and four inches depth. This ladder by Bellewood Designs is smooth, stable, offers no splinters and blends in beautifully with country home décor. Don’t let the price put you off, for this beauty is worth every dime. The blanket ladder selection is growing by the day, but one of the main problems with many of them is the lack of rungs. The fewer levels they come with, the less you can put on them. That’s why this blanket ladder from JustKnotWood is a firm favorite with many consumers. It has not only three or four rungs, but five by default. It’s also a six-foot ladder that’s ready to transform your home storage solutions. No matter where you put this 72 x 20-inch ladder, it’s going to stand out from the crowd. It features solid pine wood, a rustic Early American stain, and clear coating to protect it from damage. The angled rungs are also all an equal distance apart which means your quilt display is going to look fabulous. Even though the ladder has screws to keep the rungs in place instead of the more traditional dowels, don’t let that put you off. It has a beautiful smooth finish, an affordable price tag, and is presented well for any part of your home. It’s worth a closer look. Trying to display your wares at a market without a blanket ladder is no easy task. You want them to look attractive, but you also don’t want to have to lie out anything flat. That’s where this beautiful display ladder from Ozarks Fehr Trade Originals comes in. Even though it’s more suitable for display pieces than home use, it’s a beautiful purchasing opportunity all the same. It stands 47.5 inches tall, offers four rungs, and is capable of holding up to seven blankets. It’s also handmade in the USA, foldable for transport, and is non-toxic too. Therefore, it’s safe to be around children and pets. What may also appeal about this blanket ladder is its convenience. You can fold it out at your market stall, load it up with blankets, then let the beautiful contrast of the quilt colors against the wood help to sell the products. Its price tag is quite high given its restricted use, but it’s a welcome addition to any quilt seller’s repertoire all the same. A traditional blanker ladder leans up against a wall, and that’s about it. This one, however, offers so much variety and versatility that you’ll be wishing you bought one sooner. While you can lean it up against the wall, you can also fold it in half and use it with its A-frame design. If that’s not enough to convince you to purchase it, nothing will. You can also choose from four color schemes – all of which come with five reinforced rungs. Each rung is capable of holding up to 10 pounds of weight. The custom design of this beautiful blanket ladder also means it will stand five and a half feet tall when you don’t fold it in half. It’s sturdy, well made, has no splinters, and has a competitive price tag too. Whether you want a blanket display for at home or your market stand, you may find this is the one that ticks all the boxes. Take a closer look and see if it fits the bill for your requirements. Whether you’re storing blankets, quilts, or towels for guests, you will find this blanket ladder from Zaycup Rustic Boutique could tick all the boxes for your storage needs. Instead of hiding everything away in a drab cupboard, you can put your beautiful pieces on display for everyone to enjoy and access at a moment’s notice. This blanket ladder also fits well into a farm-style home, sitting six feet against the wall and featuring Southern yellow pine. It has five rungs to cater to five blankets, and the entire ladder sits at a 10-degree angle. What’s more, it’s 19 inches wide with 16-inch rungs, which means you can fit a large blanket on this ladder with no problems at all. The only negative thing to say about this ladder would be the lack of wall protection once you set it up. Otherwise, it’s well made, beautiful, has intricate detailing and has a competitive price tag to go with it. What more could you need? 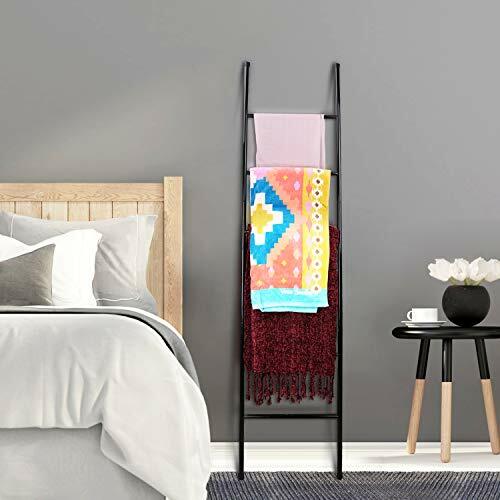 Aside from having no felt or padding to protect your walls, this blanket ladder from Pipe and Wood Designs has a lot to offer the average consumer. Its main standout point, however, is how dramatically it differs from the traditional blanket and quilt ladder. Instead of only wood, it uses raw gray steel and rustic wood with an espresso finish in its construction. The framework of the ladder is wood, while each of the four rungs with 14-inch lengths is steel. The industrial look and feel of this ladder are bound to capture your attention. It’s also affordable, offers plenty of rungs for items, and is suitable for blankets, quilts, clothing, scarves, and more. It’s not your traditional blanket ladder by any stretch of the imagination, but that doesn’t mean it’s not tackling the storage market head-on. There’s no harm in taking a closer look at this ladder and seeing how it can blend into your home. It seems that everyone these days is trying to get their hands on a new blanket ladder. They appear in all the new home and garden magazines and are very “on trend” for blanket and towel storage. However, most of the options tend to look the same – with a few variations here and there. That’s where this model from Sunland Artisans bucks the trend. Even though you pay the price tag of a mass-produced ladder, you get a unique and beautiful piece of furniture that stands out in a league of its own. 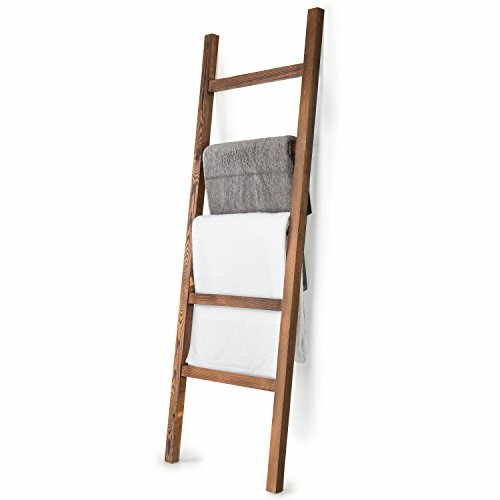 Instead of a rustic style, this blanket ladder has more of an island feel. It features pine log Kiva wood, and each rung has nails to keep it in place, coupled with rawhide bindings. 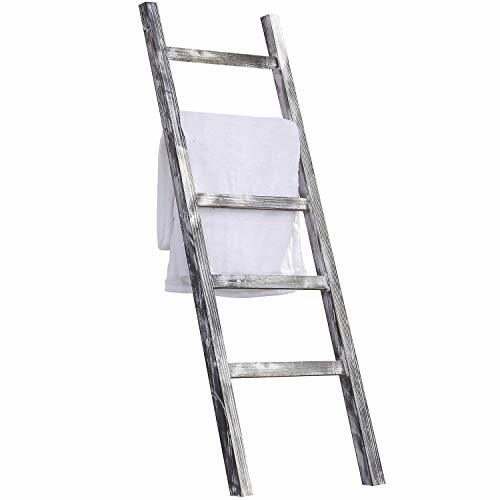 You can buy a short two-foot blanket ladder for use in a bathroom or somewhere similar, or a six-foot version instead. The two-foot version has three rungs, while the six-foot ladder has five. Either option may tick all the boxes for your needs. What’s more, you can use this blanket ladder inside your home or outside. The pine logs can withstand weather conditions far better than other ladders for sale, making it a desirable product for a range of people. What you need to be aware of, however, is the disparity between the units. As they are all hand-crafted, it’s not uncommon to come across knots and cracks in the wood. This may end up posing a problem in the future. If you leave it outside, it can also succumb to weathering and the elements as well. If you are in the market for a new blanket ladder, then there are a million and one reasons why this version should be near the top of your list. Stand out from the crowd, but don’t pay a fortune to do so. If you consider yourself to be an advocate for the environment, then look no further than this blanket ladder from The Appalachian Artisans as your next purchase. Even though it seems like a high-end piece you’d have in a fancy furniture store, it’s been lovingly handmade with reclaimed wood. It stands 60 inches tall with a 23-inch width and is lightweight due to its 1.5-inch thickness. You can also stand it up vertically, horizontally, or even hang it from your ceiling. There’s no limit to the customization aspects of this blanket ladder. All of the reclaimed wood, once it’s made into a blanket ladder, then has a weathered saddle stain applied before being finished in clear wax. The addition of the wax means it’s smooth, easy-care, and doesn’t require any dusting or maintenance. There is also plenty else to love about this blanket ladder. It handles a lot of blankets, features durable wood, and looks the part in many different homes. There is only one thing that might hold you back from buying them. Because they feature reclaimed wood, every single ladder is different. If you were after consistency while buying more than one, then you would not get it with this. Each ladder may have different colors, wood types, and weathering effects instead of consistency across the board. However, given all the other features, and how beautifully they would tie into your home, there’s every reason to weigh up the pros and cons and see if they are right for you. 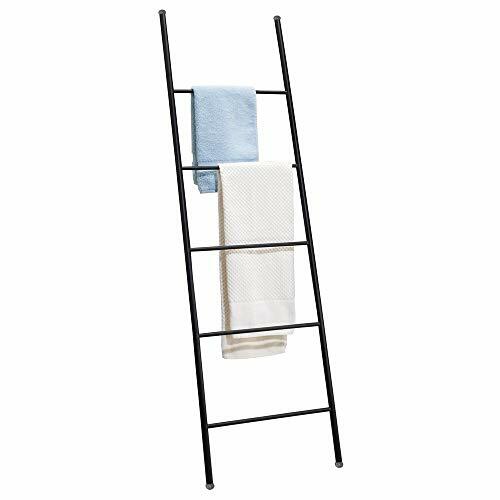 If you’re tired of pushing closets and cupboards into every corner of your home to store things you’ll need to use regularly, then it’s time to look at purchasing a blanket ladder. However, instead of buying the first one you see, do your homework. No one likes being disappointed with their purchase, and think of the hassle of having to send a ladder back to a supplier! Avoid it where possible by considering the following information. The first thing you need to ask yourself is what you will be storing? While a blanket ladder does, of course, hold a blanket, it can also do so much more. Do you want to use yours for blankets, quilts, towels, or even scarves? Are you looking for something to accompany you to markets for displaying your wares? What you intend on using your ladder for can make all the difference to the model you choose. Now you know what you want to use your ladder for, consider its height and rung count. How many items would you like to store at once? The taller the ladder, the more rungs it typically has for storing towels, blankets, and more. The tallest option also tends to be six feet, but you can also buy some that fold in half to store half on each side. The next thing to consider is what materials you want your new blanket ladder to have. The most common is wood, which is also what the more traditional ladders were first made from too. However, you can also choose from reclaimed wood, steel, and mixes of both now also. No one likes damaging their walls – especially if they can avoid it. That’s why when you decide to buy a new ladder as a funky storage option; you should pay attention to how it looks on the wall. The feet sit securely on the floor without scratching your wooden panels if they have felt or rubber tips on the bottom. The piece at the top that angles flat against your wall should also have something soft like felt to stop it marking it. Find out what protection measures, if any, a manufacturer has in place before buying a new ladder.